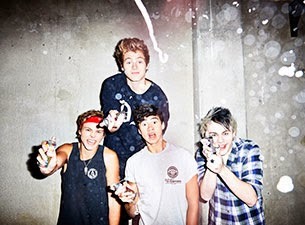 5 Seconds Of Summer have announced they will be hosting their own convention, DERP CON, later this year. A message from the band with all the details can be found below. Fans can sign up for more information here. "We are very excited to announce the 5SOS Convention: "DERP CON"!! Derp Con 2014 is us bringing people from all over the world to Los Angeles USA to fight ninjas, internet haters and join in some serious banding. We are launching a worldwide competition where entrants (i.e. you!) have the chance to be a part of this between November 15/16. As part of your reward, you will fly over to LA with a friend (prize incl. flights & accom) to attend Derp Con and come hang out at The Forum for our biggest headline show yet! There we will draw our battle lines and prepare to fight our foes. None shall stand in our way. Those enlisted to join our league (along with their faithful sidekicks) will be assigned the task of representing their country and showing the rest of the world how awesome they are! We wish we could bring you ALL along... so if you can't come, we’ll be posting info on how you can get involved online very soon! This is going to be EPIC. We cannot even begin to tell you...."